Amtrak: Want to shrink your operating deficit? Don’t devalue your product. I’ve said this a few times at Observation Tower, and it is once again evident: when it comes to increasing revenue and improving the customer experience, Amtrak management thinks reductively. This is true systemwide, but particularly when it comes to the long-distance trains, which could benefit from some expansive, outside-the-box thinking. Witness this week’s announcement that, for an 8-month trial period from this June through next January, the traditional dining car will be removed from the Silver Star, leaving only the standard Amcafe serving the same fare as found on Northeast Regionals and short-distance trains (other than the California corridors, the Cascades, the Downeaster and the Piedmonts, where the sponsoring state(s) have exercised discretion over food & beverage offerings). Black bean veggie burger in the northbound Silver Star's Heritage diner, served in southern Virginia on Oct. 27, 2014. Photo by Malcolm Kenton. Congress has mandated that Amtrak eliminate losses on food and beverage service — in spite of the fact that passenger train operators have, for over a century, seen this service as a loss leader, rather than its own profit center — and the company has formally committed to doing so. However, management seems only to understand this to mean cutting costs, rather than increasing revenue — either of which would bring the company closer to the goal (which history shows is extremely dubious). Management is taking a gamble that the reduced sleeping car prices on the Star — a consequence of unbundling the cost of meals from the accommodation charge — will boost sales enough to at least make up for the lost revenue. But sleeper capacity is so limited as it is that it does not seem like there is much room to put many new passengers who the lower prices may attract. Indeed, existing demand for space on long-distance trains is currently so strong that one wonders why Amtrak would sacrifice any of the current revenue-- or for that matter, the inherent value of one of its marquee products. One could even speculate that Amtrak management may be anticipating poor financial return and customer satisfaction despite the crush-load capacity that will inevitably result, in order to prove to certain members of Congress that the company can’t cut its way to success. Amtrak should be applauded for at least being willing to try something different. But I am not as wild about this experiment as Fred Frailey is. The ultimate outcome for Silver Star sleeping car passengers during the trial period will be a significantly diminished travel experience for only a slightly lower price relative to the distance traveled than other Viewliner-equipped trains. The only indications Amtrak has given so far indicate that the Star’s “cafe/lounge” will not be enhanced in any way compared to the standard Amcafe. This would not be as much of an issue if the Star were truly a duplicate of the Silver Meteor, but their routes and schedules are different enough that some passengers — those going to or from Raleigh, Columbia or Tampa, for example — will be left at a distinct disadvantage, without direct access to a full-service overnight train. These communities will be left with only the choice of a less expensive, diminished product. And on a larger level, a government-supported company will likely witness the lowest level of operating loss in its existence, having achieved this by cutting costs in ways that also directly cut revenue. It seems, at least on the outset, to be a lose-lose for passengers. Conceptually, I’m all for giving sleeping car passengers the option of unbundling meals from the accommodation charge. Ideally, this would be matched with another class of overnight accommodation that would make sleeping more comfortable, but would not come with all the privacy or extra services that the existing “first class” sleepers include. And, ideally, unbundling meals would make for a significant price differential. However, given the current equipment constraints, a better experiment would be simply to lower the base accommodation charge but give passengers the option of adding on a certain amount for an enhanced service — call it “Sleeper Plus,” to borrow VIA Rail Canada’s terminology — that would include dining car meals, as well as extras such as in-room wine or champagne, a morning newspaper, and similar add-ons. A former CB&Q coach turned diner as part of the northbound Silver Star's consist, seen at Jacksonville, FL on Oct. 26, 2014. Photo by Malcolm Kenton. As Bob Johnston reported in the May issue of Trains, VIA is taking a gamble that there is enough of a market for high-end service on its flagship transcontinental train that it has remodeled several cars and added many extras for “Prestige Class,” will cost upwards of $5,000 for a Vancouver-Toronto trip. 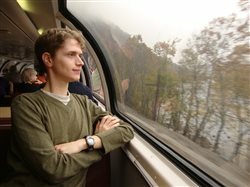 However, they are retaining three other classes of sleeper service — open sections, single roomettes and double bedrooms — and frequently offering them at half off the base fare, or as low as $600 for a Vancouver-Toronto trip, with meals included. On a per-mile basis, this is cheaper than the base Roomette fare on any Amtrak train (though if you divide the Roomette accommodation charge between two travelers, the rates become comparable). Yet, the presence of the Prestige Class on the Canadian does nothing to diminish the travel experience for other sleeper passengers (who retain access to all the common amenities). I look forward to seeing the results of the Silver Service unbundling experiment — with regard to revenues and costs as well as customer satisfaction — with the caveat that comparing the Star with the Meteor is not 100% apples-to-apples. But if Amtrak’s goal is to further close the gap between passenger revenues and operating costs, the company’s tactics should be closer to those of VIA: charge extra fares for additional services while keeping fares at affordable levels for base-level services. Much of the travel industry counts on revenues from high-end customers to make the experience affordable to bargain-seekers. There are many ways to improve the bottom line without cheapening the overall experience — which is the essence of any transportation product that is reliant on the journey being more than just a way to get to a destination. As a follow-up to my last column on the threat to Amtrak Cascades runs south of Portland, the co-chair of the Oregon Senate’s Joint Budget Subcommittee on Transportation and Economic Development said Monday that there is no intention to let the service be terminated, but declared that full funding would only come if ODOT and Amtrak are able to successfully negotiate with host Union Pacific to push the day’s first southbound departure from Portland back to a more appealing hour than 6:00 AM, while still allowing for a full day to be spent in Salem, Albany or Eugene before returning on the evening northbound train. State budget negotiations continue to unfold, but the threat of a service reduction appears to have diminished — likely thanks to train advocates making their voices heard in Salem. However, the Heartland Flyer (funded jointly by Texas and Oklahoma) continues to be in jeopardy, with Texas refusing to increase its operating support in spite of the train’s costs to the states having increased as a result of PRIIA Section 209. It’s up to Oklahoma legislators to come up with the remaining funding. The Northern Flyer Alliance, a regional passenger advocacy group, is calling on Oklahomans to email their state Senators, particularly Sens. Clark Jolley and Dan Newberry, who have expressed skepticism of funding passenger trains.